Companies aren’t disrupted, components in the value chain are. Disruption is either the consequence of new technology, business models or changes in customers demand patterns. Teams need a tool to systematically examine and evaluate the entirety of their business strategy (divided into its components) to find where to look and build scenarios for how to react. Breaking up the business into components hopefully helps to isolate opportunities and threats and more clearly see potential challengers that would remain invisible when looking at their business as a whole (because disruptive competition often emerges from completely different approaches or industries – and not those with an identical value chain, technology or core business model). 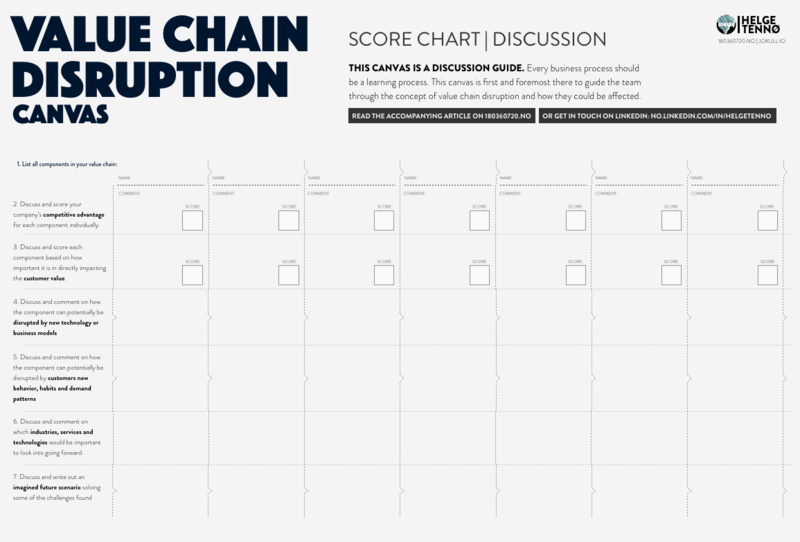 Following up on my article on value chain disruption I have prototyped a canvas to help teams discuss components of their value chain individually – to pinpoint safe ground or murky depths. This is a prototype. I’m publishing it hoping to collect some feedback on how to improve it into a better working canvas and method. My approach is not to design a canvas that should work as a visualization aid or rapid prototype (as the Business Model Canvas). But rather to support the theory that every business process should be a learning process and that visual, tangible tools could help a team’s ideation, exploration and design – with the advantage of a shared language and goal. Download a pdf-version of the canvas here. And I am looking forward to getting your feedback. as always thought provoking work: “every business process should be a learning process ” love that and is definitely true.